I’m not much of a painter. But looking at the miniature paintings of Carol André makes me wish I were! 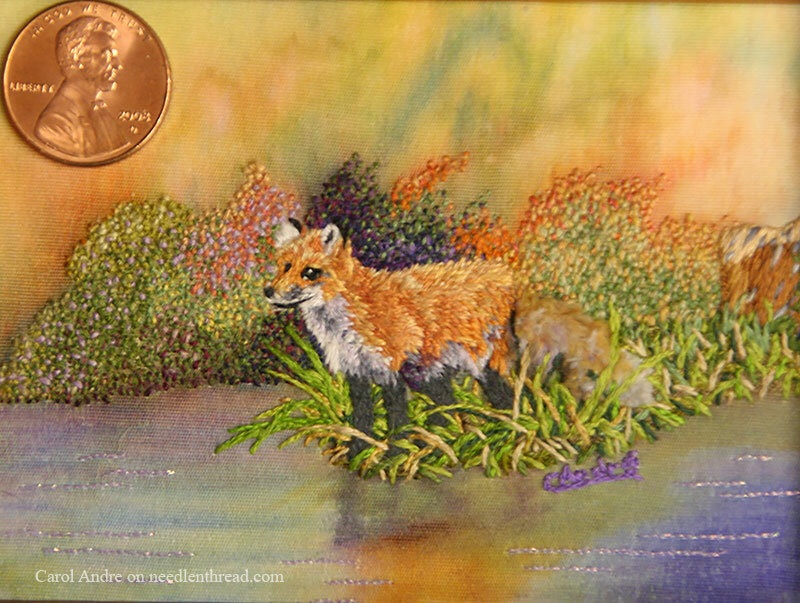 To add a new dimension to her artwork, Carol began adding some embroidery to some of her miniature paintings, and the outcome is quite delightful. Keep in mind that these pieces are small – and you’ll get the sense of how small, at the end of the article! Carol begins with the painting, working on white muslin. You can see the very first steps in creating this piece in this article on her blog. The church is painted in with minimal details, and then embroidery – long and short stitch and a mix of other stitches – is worked on top of the painting to add the details you see in the church building. She even uses metallic threads on cross and the top of the steeple. 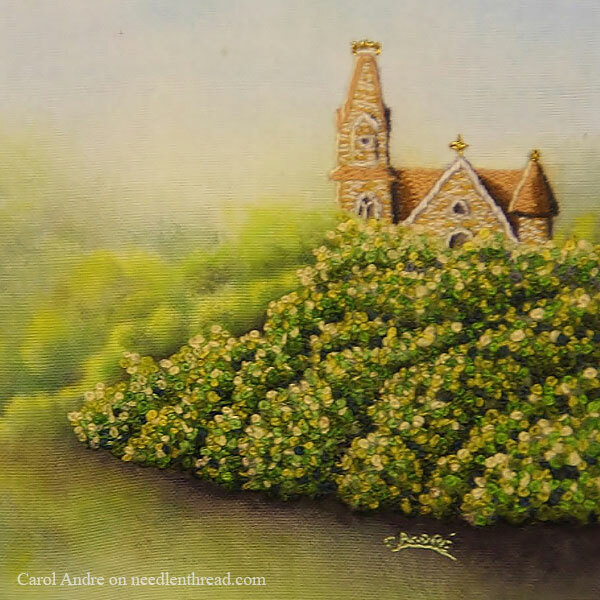 The foreground bushes are composed of layers of wool felt, cut and sewn down – almost sculpted – to conform to the shape of the vegetation, and then they’re covered with an amazing amount of French knots, bringing the whole front vegetation and the church into focus against the hazier watercolored background. This piece, titled “Hill and Dale,” is completely underpinned. The forward parts were then embroidered, starting in the background and moving to the foreground with denser stitching. About midway in the hills, Carol began adding felt padding, which was layered thicker and thicker towards the front, and sewn down around the edges to further define them. Then, the embroidery was worked over the padding. The row of trees is lightly felted, and the foremost tree on the right is worked in French knots with small stitches visible underneath for branches. The front grasses on the left are padded with felt, and then embroidered over with the tambour needle, and then clipped. So many techniques in one little space, and they all work together so well to create the landscape. I love this piece! …and then embroidered the foliage into focus with lots of French knots! Finally, the fox is added with long & short stitch, satin stitch, and a fluffy Turkey work tail. The grasses are embroidered around his legs, and even the water is highlighted with tiny stitches in metallic threads. And the penny is for perspective! See what I mean about small? 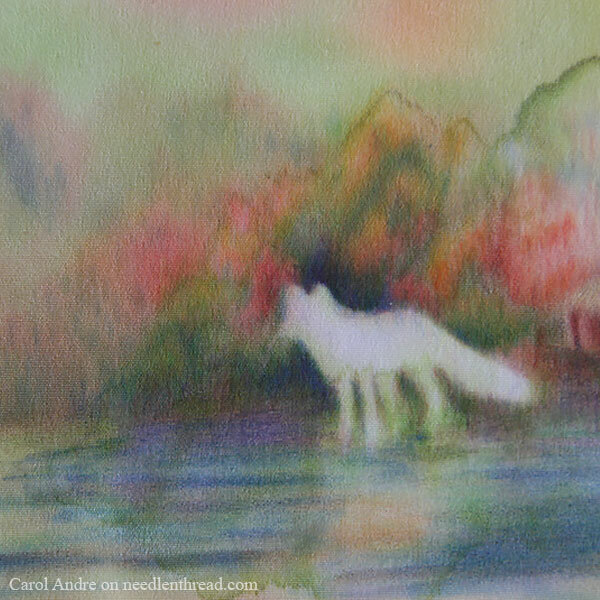 I hope you enjoy this glimpse of Carol’s miniature mixed media masterpieces as much as I do! I think they’re a lovely combination of art forms, and simply charming. 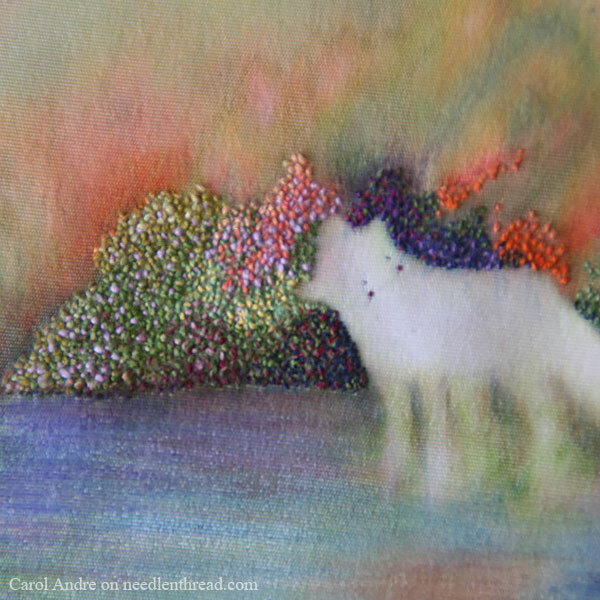 You can see more of Carol’s work on her blog, Nature Art by André. If you like owls, you’ll love the first photo on the site! July 13, 2010 Miniature Embroidery: How Small Can You Go? 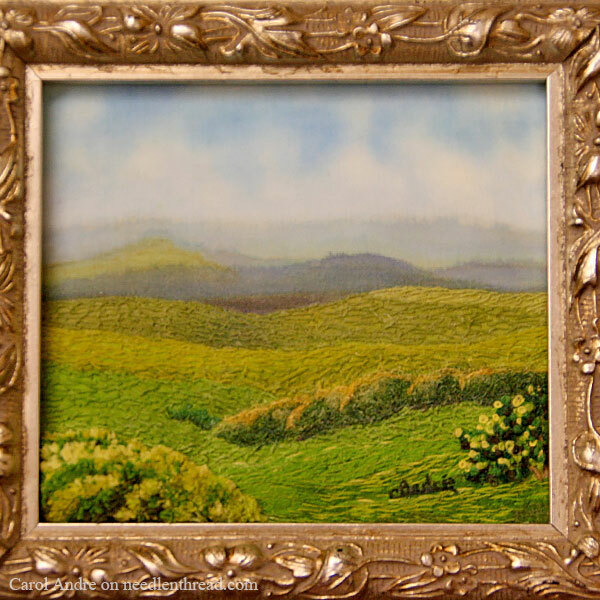 What a great way to create landscapes mixing up paint and embroidery. I truly wish I could draw but I am really bad at drawing, but I do admire people who have talent like the above. The artwork above are beautiful, I love the fox and the landscapes and Church so lovely and unusual. There are so many possibilities with art and embroidery that it’s endless. Well done Carol beautiful work. Thanks Mary for sharing Carol’s art and embroidery work with us, it makes me want to take up art so I could incorporate it in my embroidery, lovely. Oh, “Hill and Dale,” how lovely! Inspires me to try underpinning. Thanks again for showing another talented artist. Oh good golly Miss Molly! I cannot possibly stitch that small, and my painting never looks like that, but boy do I appreciate those who can! I just love the mixed media. This is wonderful — thanks for sharing Mary. They are beautiful. I reread your article and yes, she does add the felt padding or other padding and then stitches on top of that. That would seem to make it more difficult to create all those tiny stitches when working on a “hill.” Plus I’m used to stitching through the fabric, front to back to front again. Knowing she has to pick through the surface only makes it even more incredible to me. I wonder if she stitches on a frame or in hand. Hmmm. That would be a “floor stand frame”. Also, forgot to mention, I’ve learned a bit since that first one. LOL. I embroider the muslin, then add the padding and the quilting, etc. I’m just a bit blonde at times and it takes me a while to figure things out… thank heavens for Mary, she makes things easier. LOL. My oh my, Mary! 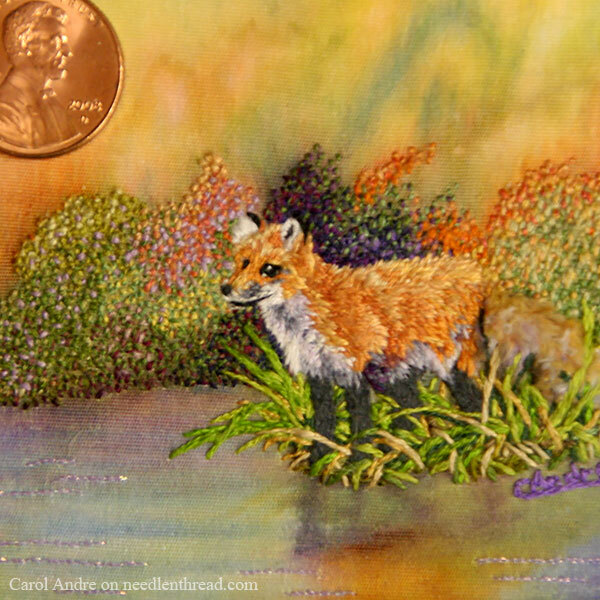 Thank you for sharing Carol’s miniatures & a little glimpse into her technique. You are killing us with kindness with all these stitched goodies. Surely it will take another lifetime just to try all the ideas you have collected for us! Thanks again for posting inspiration in a nutshell every week day. Dear Mary: I just love your blog. I read it every day without fail and have great hopes of trying many of the techniques you share. I’ll leave the lovely miniatures to Carol. What talent. Thank you for sharing with us. Oh, my gosh, Mary. I am SO HONORED! What a shock to open my email (late today) and see this!!! I just do not know what to say, but thank you!!! I wasn’t sure if this would be at all something you would be interested in, but since you inspire me constantly I thought I would share it just in case. I have so much enjoyment from your blog each day, you have no idea. It is like having “coffee (or tea) with friends” to start my day, usually. Life right now is terribly hectic as I am driving back and forth to Ark. trying to get this house built so we can move, taking care of my father who lives with us this past 1 1/2 yrs., and packing, teaching piano, etc. I have not been able to comment this past while as I’ve only been able to read, but not comment with my phone in Ark. I will have a new, glorious studio, and hope, with your continued wonderful inspiration to be able to get back to work at my art. Her work truly is amazing! Next Next post: Tool Talk: Custom Slate Frames!